Unai Emery showed that he isn’t just any ordinary football manager in Arsenal’s 4-2 win against Spurs at the Emirates on Sunday, as some fans on Twitter pointed out. 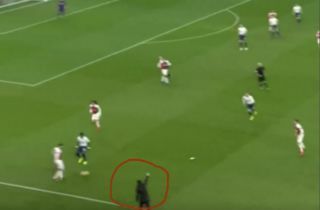 With the north London side being 3-2 up in the 2nd half, Emery can be seen telling his players when to pass in the lead up to Torreira’s strike, a goal that ended up being a superb finish by the Uruguayan. The Gunners showed exactly what they’re all about under Emery with this move, as Spurs were left helpless in their attempts to prevent their north London rivals from scoring their fourth of the match. This moment from Emery is so impressive, some fans on Twitter even described the Spaniard as ‘orchestrating’ Torreira’s goal last week. And given just how he moves in this clip, we can see the resemblance!